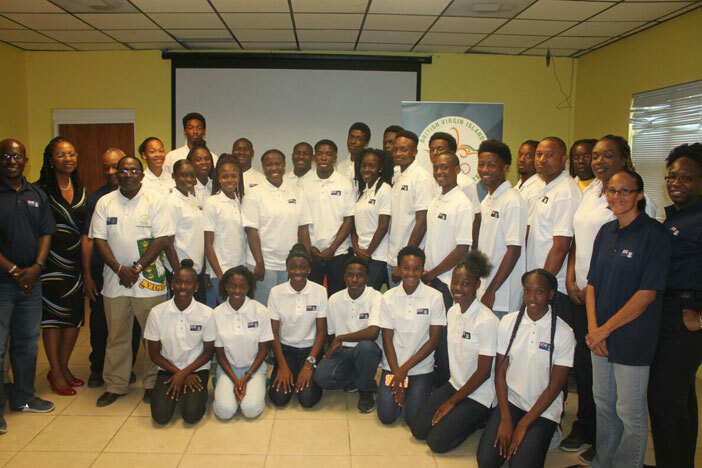 The BVI Athletics Association is sending its largest ever delegation to compete in the 46th Carifta Games in Willemstad, Curacao, over the Easter Weekend. The 26 athletes selected, is its largest since it has been participation in the Carifta Games since 1976 and will be led by U18 athletes Beyonce DeFreitas and Djimon Gumbs, both of whom finished fourth and fifth respectively in last year’s competition in the 200m and Shot Put events. Both have also qualified for the International Association of Athletics Federations World Youth Championships in Nairobi, Kenya, July 12-16. DeFreitas is coming off winning a sprint double during last weekend’s Elmore Stoutt High School Inter-House competition where she ran the 200m in 23.98 seconds, just of the 23.97 personal best she recorded at last year’s Carifta Games in Grenada. She also won the 400m in 56.02 seconds. Gumbs improved his 17.20m (56’5½”) Shot Put effort during the BVI Carifta Games Trials in early March, with a mammoth heave of 17.52 (57’5½”) on his final attempt, of the inter house competition. Rikkoi Brathwaite who narrowly missed and U18 Boys 100m bronze medal by 0.03 seconds last year, will lead the U20 team. BVI athletes are to see action in 15 disciplines over the three days of competition. BVI Delegation: U20 Male: Rikkoi Brathwaite, IMG Academy, 100, 200m, 4x 400m Relay. Jhont’a Charles, Fast Lane Track Club, 100, 200m, 4 x 400m Relay. K’Cei Moses, Sprint Tech, 200, 400m, 4x 400m Relay. D’Andre Mitcham, Top Notch Track Club, High Jump. Deron Leslie, Raw Skillz Track Club, 1500m, 5000m. Gevon Smith, Sprint Tech, 800m, 4 x 400m Relay. U18 Boys: Djimon Gumbs, Top Notch Track Club, Shot Put, Discus Throw. Diamante Gumbs, Top Notch Track Club, Shot Put, Discus Throw. Jelani Norman, Sprint Tech, Octathlon, 4 x 400m Relay. Joshua Hill, Sprint Tech, 400m 4x400m Relay. Rakeel Jack, Sprint Tech, 400m, 400m Relay. Samuel Romney, Sprint Tech, 1500m, 3000m, 4 x 400m Relay. Malik John, Sprint Tech, 4 x 400m Relay. U20 Girls: L’T’Sha Fahie, Sprint Tech, 100m, 200m, 4x400m Relay. Shaniyah Caul, Raw Skillz Track Club, 400m. Akira Phillip, Ambassadors Track Club, Javelin Throw. Kala Penn, ASA College, Long Jump, Triple Jump, 100m, 200m, 4 x 100m Relay. Sh’Kaida Lavacia, Sprint tech, 400m, 4x400m Relay. U18 Girls: Beyonce DeFreitas, Sprint Tech, 100m, 200m, 4 x 100m, 4 x 400m Relay. Zakharia Frett, Sprint Tech, 100m, 200m, 4 x 100m, 4 x 400m Relay. Zara Brown, Fast Lane, 4 x 100m, 4 x400m Relay. Arianna Hayde, Sprint Tech, Javelin Throw, Heptathlon. Xiomara “Gia” Malone, Fast Lane, Long Jump, 100m Hurdles. Tashara Edwards, Sprint Tech, 400m, 4 x 100m, 4 x 400m Relay. Akrisa Eristee, Sprint Tech, 400m, 4 x 100m, 4 x 400m Relay. Mariah Christian, Raw Skillz, 1500m and 3000m. Officials: Ralston “Grandfather” Henry, (Head Coach). Assistant coaches, Burt “Percy” Dorsette, Carl Barrett and Jennifer King-Grate. Chaperone, Chantal Scatliffe.